By default, fonts which can be used to generate pdf file using PHP FPDF Library are only predefined standard fonts bundled along FPDF Library such as Courier, Helvetica, Arial, Times, Symbol, and ZapfDingbats. Contrary to apps like MS Word which could use fonts installed in the computer, FPDF won't recognize any fonts installed on the computer. FPDF could not directly use fonts from ttf files. instead, the ttf file should be converted into fpdf font library which consists of php files and a "z" file. 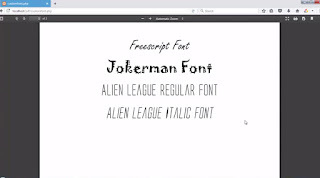 We need to convert the ttf font into those library using a script provided by fpdf library in order to be able to use the fonts in our documents. In this tutorial, i'll explain how to convert, add and use custom font in FPDF library. For how to use fpdf library to generate pdf file in pdf, see Generate Printable Invoice in PHP using FPDF Library. 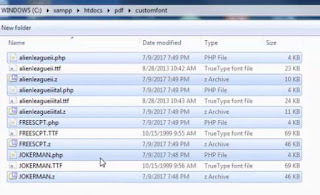 To turn ttf font into php in order to use it in our generated pdf document, we can use makefont.php script inside makefont directory provided along with fpdf library distribution. You can download fpdf library here. First, extract the files into your web directory (htdocs or www). Inside, you'll find a folder named "makefont". Next, create a directory to place your ttf files (ie. customfont) which will be converted into fpdf font library. I took 4 fonts as an example in this tutorial. Run your command line or terminal, then enter the customfont directory using cd command. Where <path to makefont.php> is either static or relative path to your makefont.php file, and the <font file name> is your font file name followed by .ttf extension. It's case sensitive. Repeat those steps for other fonts. 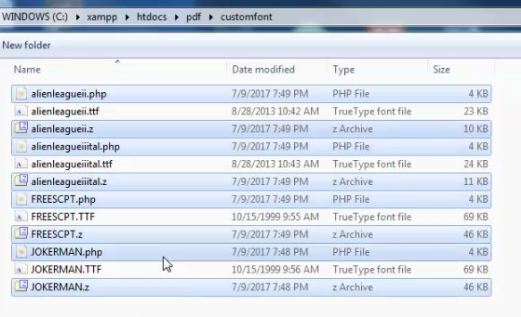 After you done converting the ttf files, go back to your customfont directory, you'll get some php and z file with font names in it. Copy those files, leaving aside the ttf files, into the font directory inside fpdf17 directory. 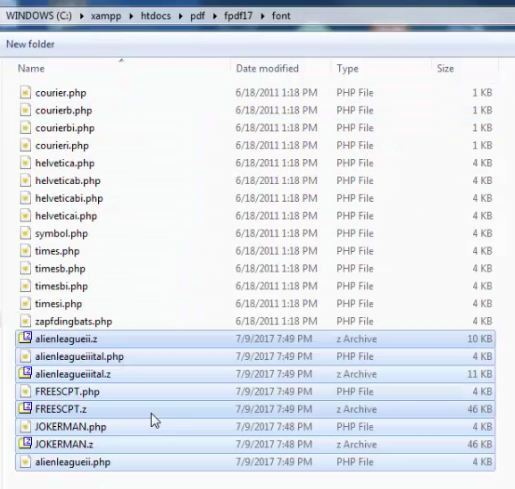 Then create a new php file for the pdf generator, include the fpdf.php library, and create a new FPDF object (Read Generate Printable Invoice in PHP using FPDF Library for further references on how to do that). To add the font into the documents, use AddFont method of fpdf library. The first parameter is family name, second parameter is the font variant, third parameter is font's php file name. The font family name can be chosen arbitrarily. If it is a standard family name, it will override the corresponding font. The default value is regular. Please keep in mind that you need to add the fonts before you use it. So it's usually placed after fpdf object definition. Keep in mind that Freescript font used in this tutorial have no other variants beside regulars. So $pdf->SetFont('Freescript','I',36); would not work. But $pdf->SetFont('Alien League','I',36); will because we add the italic variants of Alien League font beforehand. And here's what the results look like. For the video explanation of this tutorial, please watch this video. 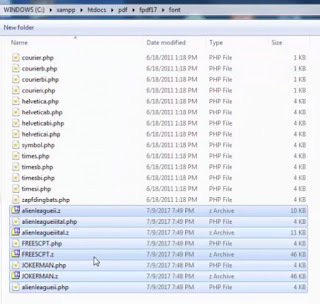 And for other tutorials regarding PHP FPDF Library, please watch my youtube PHP FPDF Tutorial Series. Sir, please create tutorial using fpdf how to insert qr code on the invoice document. Your tutorial is very nice to be watch. Sure i will. And i'll also do barcode too.